I am an unashamed collector of retro garden gnomes. It wasn't always so - in 2002 one lonely bachelor gnome (a relic from my younger, sillier days) lived an unremarkable life in the rockery by the old dog kennel. But I've always enjoyed retro things in reasonably dodgy taste. So concrete chaps who'd sat in other people's gardens for years, their coats peeling, were offered a fresh start in a good country home - and new clothes. Things got a bit out of hand as I gradually became a collector. 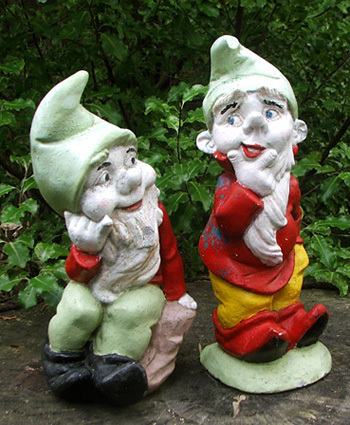 I would buy any old retro gnomes I could find - actually paying good money for them. How silly is that? I can hear you ask. But worse was to come. With missionary zeal I've now transformed into a compulsive gnome rescuer. Poor, unwanted chaps, forgotten and lonely, surplus to requirements. I scoop them up, kiss their crumbling beards, and bring them lovingly home. And sometimes pay more money for them than a huge pot of double Trilliums would cost. Oops. I've asked the following garden gnome question many times before. Is there such a thing as one gardener having too many garden gnomes? Let me put it another way. How does one know one has reached one's garden gnome limit? Garden gnomes - so many different species are now available for the discerning gardener, from chubby ceramic Disney Dwarves to curly-bearded chaps copied from European arboreal forest originals. Your average common-garden gnome? There's no such thing anymore. It's springtime and something very rum is afoot in the world of garden gnomes. Over the last three days family members have rescued three discarded gnomes, each from a different charity shop. What is the world coming to? I'd never dare google-search for 'garden gnomes'. I've had enough trouble keeping tabs on my own real-life gnome, missing from his garden duties for months. Missing - or worse. Could this older-lady gardener be guilty of gnomicide? My one surviving garden gnome needs to share some of the Moosey Garden limelight. He leads such a boring life - well, compared to the inhabitants of an underwater gnome village in the Lake District. Goodness me!